Have you seen the Ervamatin ad on TV? The ad claims that you can stop hair fall in 2 weeks of usage and you can also grow new hair within 2 months of using it. In 6 months time, you will have like Bob Marley it seems. They also show client testimonials with photo proofs. Ervamatin manufacturers claim that they produce the medicine from one of the finest and rarest herbs which are only found in the Amazon forests. I did a google search and found to find how the hair of the people in Amazon forest look like? I got this picture which I have posted here. 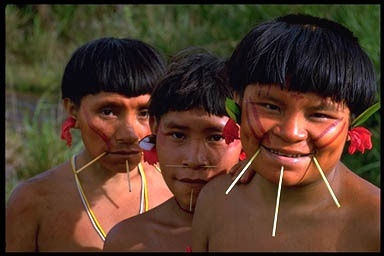 People in Amazon forests in deed have thick and long hair. I am balding and hence I am thinking of buying this product. As a matter of fact, I have been telling for the last 8 years that I am balding; but I am not. My friend Robert used to pour Ervamatin oil on his palms, rub them and then apply it on his hair. As a result , hair grew on his palms. That was indeed a scary sight. If I ever buy this oil, I will use gloves on my hands. I don't want to look like Anil Kapoor. One question that I have after watching this ad is "Why don't they reveal the name of that rare Amazon herb?" Are they scared that I will go all the way from Chennai to the Amazon forests, pluck the herb and apply it on my head? Note: The robert story is not true. you have a great sense of humor! Keep writing! LOL @ the last line and this: "As a result, hair grew on his palms."